Syllabaries often begin as simplified logograms, as shown here with the Japanese katakana writing system. To the left is the modern letter, with its original Chinese character form on the right. The languages of India and Southeast Asia, as well as the Ethiopian Semitic languages, have a type of alphabet called an abugida or alphasyllabary. In these scripts, unlike in pure syllabaries, syllables starting with the same consonant are generally expressed with graphemes based in a regular way on a common graphical element. Usually each character representing a syllable consists of several elements which designate the individual sounds of that syllable. In a true syllabary there may be graphic similarity between characters that share a common consonant or vowel sound, but it is not systematic or close to regular. For example, the characters for 'ke', 'ka', and 'ko' in Japanese hiragana have no similarity to indicate their common "k" sound (these being: け, か and こ). Compare this with Devanagari, an abugida, where the characters for 'ke', 'ka' and 'ko' are के, का and को respectively, with क indicating their common "k" sound. 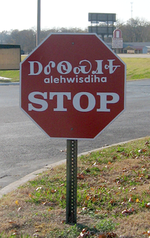 English, along with many other Indo-European languages like German and Russian, allows for complex syllable structures, making it cumbersome to write English words with a syllabary. A "pure" syllabary would require a separate glyph for every syllable in English. Thus one would need separate symbols for "bag", "beg", "big", "bog", "bug", "bad", "bed", "bid", "bod", "bud", "bead", "bide", "bode", etc. Since English has well over 10,000 different possibilities for individual syllables, a syllabary would be poorly suited to represent the English language. However, such pure systems are rare. A work-around to this problem, common to several syllabaries around the world (including English loanwords in Japanese), is to write an echo vowel, as if the syllable coda were a second syllable: ba-gu for "bag", etc. Another common approach is to simply ignore the coda, so that "bag" would be written ba. This obviously would not work well for English, but was done in Mycenaean Greek when the root word was two or three syllables long and the syllable coda was a weak consonant such as n or s (example: χρυσός chrysos written as ku-ru-so). ^ Peter Daniels, 1996. "The Study of Writing Systems", p. 4. In: Daniels & Bright, The World's Writing Systems. ^ Chris Barker. "How many syllables does English have?". New York University. Archived from the original on 2016-08-22.